Last week I wrote about a full Buddhist funeral held for a Doraemon doll in Ayutthaya, Thailand. Japanese bloggers, amused at the news of the beloved robotic cat's apparent death, are responding the way they know best: with lots of Doraemon ASCII art. Check out some of the link love. Being able to read Japanese is helpful (but Google Translate also allows you to get the gist): Digimaga.net, Vistanamidame, Karapaia, tokyo.txt-nifty.com, Gakuburu, uiam.at.webry.info, Terrafor. Nice to be noticed. If only we didn't have to lose poor Doraemon to make this possible. Alas, poor Doraemon! I knew him, Nobita. 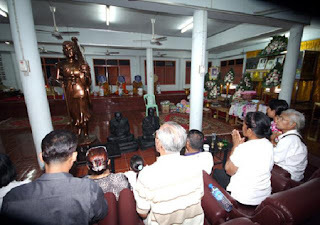 Bizarre news from Thailand: this week a lady in Ayutthaya province held a funeral for her Doraemon doll. "Mrs. Phlapphlueng Namcharoen held a funeral service for a Doraemon doll, named Jiwoei Nakthong, at Wat Mahalok in Ayutthaya province. 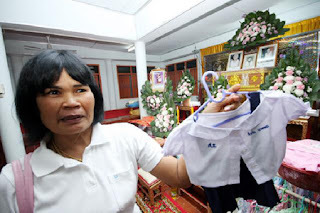 ... Mrs. Nipha Rungrueangburanakul, a grade 1 preschool teacher, revealed that Mrs. Phlapphlueng Namcharoen had actually enrolled the doll at Wat Sawang Arom School, and that each day a taxi motorcycle would drop off and pick up the doll like a regular student. She also stated that having Jiwoei in her class had made the students so happy, and they had so much fun playing with the Doraemon doll, that she began to consider the Doraemon doll to be alive like a regular person." The fact that an "eccentric" lady enrolled her doll in preschool and the school principal and teachers actually played along is bizarre enough, but hardly national news. What has captivated collective attention of the country (for 15 minutes, at least) is the untimely demise of said doll. That's right, the doll died. According to various reports including this Matichon article, the doll visited her in a dream to say it had died, and asked that she hold a human-style funeral in its honor. Now, in America at least we're no strangers to the concept of a graveside funeral for a family pet, but a full-blown funeral with casket and viewing would be odd for even a pet. In Thailand, a human-style funeral involves monks chanting for the welfare of one's eternal soul, followed by cremation. 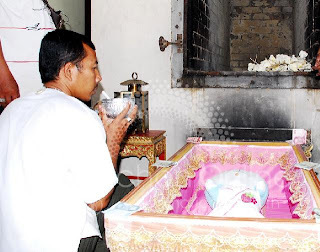 As mentioned above, the doll's funeral was held at Wat Maha Lok (วัดมหาโลก) in Ayutthaya. Just as in the west, a Thai funeral is a paid affair, so the temple's incentive for accepting this rather odd request seems clear. As a result, the temple and the monks have been the target of criticism from the Thai public for compromising their religious integrity. 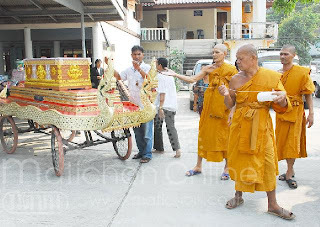 In this Pantip.com thread, users discuss whether it was wrong for the monks to agree to participate in a funeral for an inanimate object. Responses range from an adamant "yes" to a firm "no" to "I don't know, because for all I know this story is fabricated." But most important of all -- more pictures!